Does living by the coast make you healthier? The BBC is reporting that ‘People living on the English coast are more likely than those living inland to say they are fit and well, an analysis of census data suggests. ‘The researchers said living in areas such as Skegness, St Ives or Scarborough was linked to a "small, but significant" improvement in health’. The Telegraph has the headline 'The sea air? It really is healthy'. Before we go any further, there is a big difference between feeling well and being healthy. Two different claims are being made, one about quality of life, the other about levels of health. The first is subjective, the second objective and therefore measureable. People taking alternative medicine often report 'feeling better', sometimes through the operation of the placebo effect. But this doesn’t mean that they are better - and, in the case of alt med, this 'feeling' may even be dangerous if it leads to avoiding proper doctors. A notable example of this inconsistency is a study done at Bristol Homeopathic Hospital, which 'found' that 75% of children with asthma 'felt better' after treatment. The flaws in this claim were pointed out by both the BBC and Dr Ben Goldacre. Conditions may also be self-limiting (they would have got better on their own) so external factors like treatment (or where you live) can be irrelevant. Or the condition may be periodic so the patients may be experiencing a period of less intense manifestations after a more extreme one (reversion to norm). Then there is the problem of self-reporting, which is notoriously unreliable. There is a recognised psychological tendency that if people are asked to think back over a period of time, they will remember the most recent events more strongly as these memories are more salient. So if they are feeling well at the time of the census, they are less likely to focus on episodes of illness early in the year. There is also a tendency that means a long period of illness ending in a short period of wellness will be considered more bearable (and may be reported as better health overall) than a long period of wellness ending in a short period of illness. And how do you accommodate the 'mustn't complain, stiff upper lip' section of the population, the hypochondriacs and the ones who love a good moan? So both self-reporting and 'feeling better' should be ringing alarm bells in the reporting of this story. It was conducted by the European Centre for Environment and Human Health at the Peninsula College of Medicine and Dentistry at the University of Exeter. The study points out that 'robust evidence of direct, environmentally-induced salutogenic (health promoting) effects is scarce'. The researchers investigated the relationship between people who reported their health as ‘good’ in the 2001 census and how close they lived to the coast. They found that people living under 1km from the sea were 1.13 percentage points more likely to say they were in 'good health' than than people living over 50km from the sea. So it's a pretty small effect even if it is big enough to be statistically significant. One interesting finding was that the effect was stronger in the most deprived areas because living by the sea 'may mitigate some effects of living in a deprived area'. Or because wealthier people generally feel better anyway because they have better diets, living conditions and so on, so living by the sea adds less to their overall quality of life. Or because wealthier people who move to the seaside tend to be old and older people generally have poorer health. The study didn't differentiate between people who had always lived by the sea and those who had moved there or how long they need to be there for the effect to become observable. 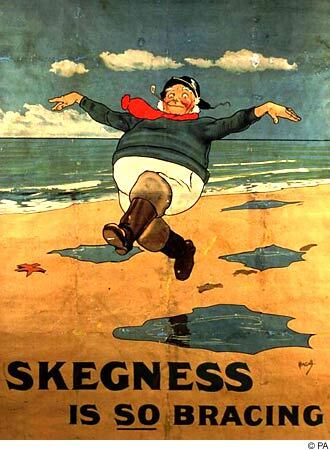 It noted positive effects of seaside living as 'increased physical activity, stress reduction and positive emotions'. While going for walks on the beach would have a health benefit, the other two effects are subjective and harder to quantify. Although the study says that there is an observed correlation between feeling healthy and mortality rates or the results of health surveys, its results don't definitively support this finding and the conclusion is only that 'coastal communities may have better physical health due to the stress-reducing value of greater leisure time spent near the sea' (my italics). It also concludes that more study is needed. To be fair to the BBC and the Telegraph, the study doesn't always clearly distinguish between health benefits and a general sense of well-being. But it is certainly not the break-through study the headlines suggest. The BBC had a related story in April, reporting that a study of 2,750 people presented to the British Psychological Society examined the effects of different types of outdoor environments on people. It found that in six different age groups the seaside was always identified as being a 'more positive experience' than inland parks or country walks. So there does appear to be a small quality of life benefit to living by the sea, especially if you're poor, but there is still no clear evidence that it is healthier. The answer to the study's title 'Does living by the coast improve health and wellbeing?' is 'health - maybe, wellbeing - probably' - which doesn't make for very good headlines. Living by the sea could be a kind of placebo. Incidentally, nothing on earth would make me move to Weston-Super-Mare.